The New Year is coming, see you then! Taking a break till the new year, see you then! Myway Mapholder, get behind them! If there is one idea that skiers should get behind this would be the first on the list, Mymap winner of ispo BrandNew Award. "In today's complex ski resorts where the number of descents are increasing and the skier's need of finding the right path to explore the whole system is growing quickly, instant access to the ski map becomes a prerequisite. With myway map holder the skier has immediate access to the map, which can be viewed without any unfolding movements or hassle to avoid wind or rain. 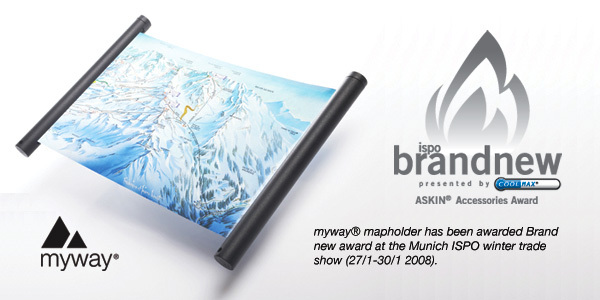 Myway map holder gives the skier a durable and waterproof map that is covered in a shell when not in use. The shell does not need to be opened in order to reveal the map; the skier merely pulls the map holder to the part of the map he wishes to view at the moment. When he is done studying the map, the map automatically returns into the waterproof shell. " I can't see what the hold up is, big gloved fingers pawing at a folded map, impossible to open and once they get wet forget about it, shreds right away. The best thing that I see with Mymap and you can say you read it here first, is once Electronic Paper takes off and you can power this little baby then it gets limitless. A GPS, speed, tracking, runs, altitude, decent, and even heart rate, you have to love technology, built in so that you can see where you are and not have to look for a sign on the trail head. Daylightagain, feel free to contact me anytime to use this idea. Things like this seem like a no brainier, simple yet unbelievably useful. From sailing to kayaking to surfing to snowboarding, any water sports, the list keeps going. The Sucky Bag has a QuickSilver logo but it's not on their site. 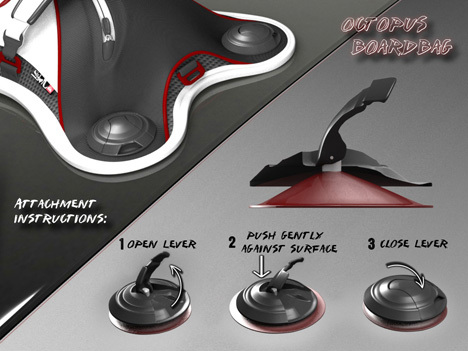 Lever-operated suction cups - attach and detach in seconds. 100% water tight inner compartment. Works on all flat airtight surfaces, makes it possible to carry your belongings in ways you’ve never done before. Silicone based rubber cups for all weather conditions. Inside compartment is lined with foam fabric for added protection. 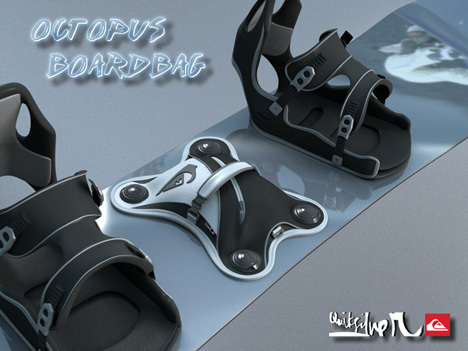 Neoprene bottom protects your board from being scratched. Use it to for your money, mobile phone, snacks or anything you can shove in it. You can even use it on travel since the suction will stick to any flat surface. Hang it on your bathroom mirror as a functional toiletry bag or inside your school locker. Haven't taken the leap to wear a bulky helmet, to macho to think that you can get hurt. Well breath a sign of relief, Head Protect is for you. It was in Haute-Nendaz, back in 1999. During a further training course for skiing instructors we were informed of the increasing importance of head-gear protection in winter sport. Over the following years I began with the development of a new kind of head protection. It was to be a warm, head-protecting woolen cap, a snazzy accessory, light and pleasant to wear. Together with a motivated and competent team, we sere able to put our ideas into practice and present our first collection at the ISPO 2005." Just remember this is not a helmet but will keep your melon warm and cozy. Hey something is better than nothing. Pick one up for the kids, just to go sledding. What a great place to shop for some of the most updated gear, to bring out the best in you. OneTri.com has all the new 2XU Compression gear. What makes OneTri.com so great is that it can be found on searches with just putting in a product code (example for 2XU WA1122a). There are many sites that come up if you type in Triathlon gear, but to put in a product code and find the new gear that is impressive. Try it! "Utilizing our exclusive 50D/CK fabric we have combined a 50 denier Lycra together with a revolutionary circular knit high gauge construction, which provides the most compressive fabric on the market. Whether this garment is used on the slopes, or participating in active sports, the graduated compression of the top is fundamental to remove all the waste by products the body produces during high active sport, which causes fatigue. The extra push of blood from the lower arms and back towards the heart allow this top to give you another level of performance and will allow you to perform longer with less fatigue. It will support the muscles and graduates the compression from the lower back and at the lower arms loosening in fit as it approaches the heart." OneTri.com makes shopping and finding gear easy and fast. Check out was great and well done. and if you sign up for their newsletter, you will get 5% off your next 5 orders, it covers the shipping. If you spend over $150 you get a free One Tri Transition Mat. Cool!